I should’ve prayed that day. Maybe, just maybe, a few hours ago would’ve been different. Who am I kidding; everything led up to that moment. This is the first time I have been in the hospital. I am speechless. The cool sheets rest upon my lifeless body. The cold silence within the room carries the beeps echoing from the heart monitor. I watched the nurse slowly walk into the room. I think she hoped for some improvement, or at least a different display on the EKG. I wanted to reach out and touch her, but…. This was a great read for me, It opened my eyes to see where I had been messing up. It reminded me that all sin is still sin so just because it may seem small doesn’t make it acceptable. I really enjoyed it, went to sleep reading it and woke up and finished it before I even got out of the bed that morning. Truly inspirational and would highly recommend it to anyone and everyone. God bless. Wow. Sometimes God does some things in your life that are amazing. Too bad I don’t ever know until after. I couldn’t sleep last night. Not unusual for me, but I got on Goodreads saw a post from a person not of the Christian faith, and chose to post an answer. While he called me a bad name, the author of this book saw my post and told me about this book. Then gave me a great gift, this book. I can say whatever I want, he can’t stop me. For me this book was moving, inspiring, truly a gift to have read it. Simply put its a book about some young men living life while decisions change their lives. Give it a chance, you will not regret reading it, you may even be changed by it. A great line, “You must come to Jesus as you are and He will do the cleaning.” It is actually repeated later by someone else. I have read several books of inspiration. Some of the books have a direct message, and others seem to have a more subliminal message. I have seen several post by this author on his blog. (dawriter.wordpress.com) Every post had its own inspiring message. Based on Author T.K.Ware’s blog, I can tell he writes to inspire and encourage people. 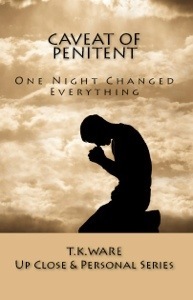 I was able to read his book entitled Caveat of Penitent. The title itself struck me. I love the challenge of new or different words. I found it quite interesting how the author conveyed a message even through his title. The word “Caveat” means a warning or caution, and the word “Penitent” means feeling or expressing sorrow for sin or wrongdoing. The title along grabbed my attention, along with the book cover, very thought provoking book cover. It really goes with the title. As I began reading the first page, I especially love the opening line-“I should’ve prayed that day.” The first line pulled me right in. The opening scene displays a character in the hospital room looking down at a corpse on the bed. As you continue reading you will discover that the character is actually looking at himself, and reflecting on the past events that brought him to this place. The author also set the scene with a very interesting poem entitled, “Departing.” The combination of the poem, and the opening lines will prepare you for a ride. The poetic expression really set the tone for the book. As I am an avid poetry reader and writer, his poem ended with a profound line. And now I am bound for eternity.